Erected by the family in loving memory of our beloved mother. Ann Sutherland died 22nd February 1881 aged 64. Son Thomas Sutherland died 6th May 1881 aged 23. 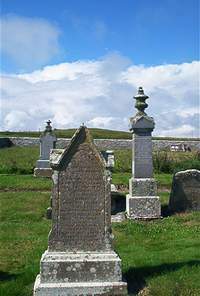 Husband Alexander Sutherland died 9th May 1895 aged 79. Son Alexander Sutherland died 5th April 1935 aged 89 husband of Elizabeth Budge.